Want to be a part of the Fall Launch Team? We'd love to have you help us! Read below to see what would be expected of you to participate in as a team member. What? A great time for reconnecting with Nav friends, training, prayer, fun, time on campus, and free time. Don't forget: Quad Day is Sunday 8/20 from 12-4pm! Make sure and stop by our table! Who: Nav college students doing a professional internship or summer job in Chicago. What: Two Fun Events, one at the beginning of the program and one at the end. Plus a laid-back gathering each week. We’ll be in the Word, pray for non-Christian friends, and have the chance to share real relationships with one another. 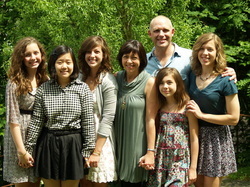 Leaders: Jay and Linda Neuharth, formerly Nav missionaries in Central Asia, now with the 20s Mission in Chicago, and pictured below with their 4 daughters and one of their 20s friends.